It is a while since we last shared our data on the position of the rural and urban areas of Great Britain and Northern Ireland and while the BDUK projects, community schemes and some commercial roll-out in rural areas has improved your chances of superfast broadband in rural areas 1 in 8 rural premises still only have options of a connection below 30 Mbps. 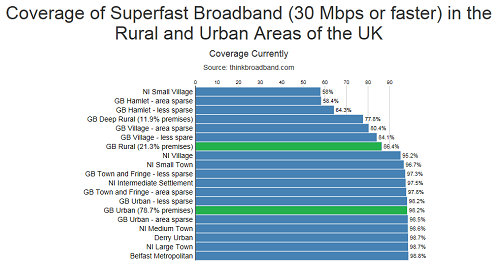 Superfast broadband (30 Mbps and faster) coverage in the rural and urban areas of Great Britain and Northern Ireland. The superfast picture in the last year has changed, at the end of January 2018 the urban part of Great Britain was at 98%, rural 85.2% and the deep rural subset 72.2%. So we can see that the big changes are still in the rural areas of the UK. 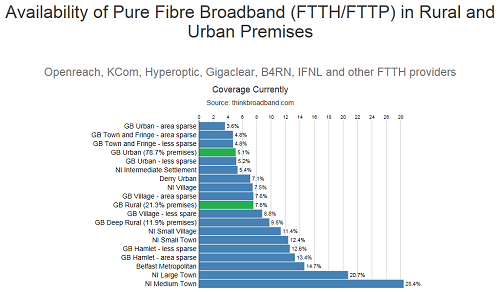 Fibre to the Premises (FTTP) coverage in the rural and urban areas of Great Britain and Northern Ireland. The situation when you look at full fibre has been the inverse of the superfast picture for some years and the rise of the FTTP building machine is visible when you consider 12 months ago 2.9% of urban areas had an FTTP option, 4.2% of rural areas and 6.9% of the deep rural areas. ONS rural/urban classifications at the postcode level are used, Northern Ireland is presented on its own since it has its own definitions of what constitutes rural and urban. The charts higher up the article include smaller sub divisions for Great Britain which have been omitted from the table for brevity. While it is possible to express these results in terms of population this would be reliant on the ONS 2011 census and estimates for population change since then, therefore we only quote the number of premises which it is easier to track. As the commercial roll-outs of full fibre ramp up we fully expect the urban areas to catch up and pass the rural areas in terms of FTTP availability. This all leads to our conclusion that around 2026/2027 that the Government is likely to launch another scheme to address the resulting imbalance, since we would not be surprised if in 2025 that urban FTTP coverage is running at around 60 to 65% and rural Great Britain is languishing with FTTP coverage at around 20 to 25%. Update 5:45pm The final column in the table has been updated from just the percentage under 10 Mbps to reflect the broadband Universal Service Obligation definition of delivering at least 10 Mbps download and 1 Mbps upload. The premises figures have also changed with some small 0.1% changes in the FTTP figures reflecting the new premises added to our broadband model in the last 24 hours. The Belfast Metropolitan area was missed from the original table and has now also been added. Great Britain Urban - 98.6% full and partial fibre - 0.3% below USO. Where does the 1.1% that is not fibre of any kind but still be above USO come from? Oops wrong column title and have changed it, that column is actually the sub 10 Mbps (no regard to upload speed). The true USO 10 down 1 up minimum is being worked on and will update later. Why does the title only say Great Britain when the article talks about Northern Ireland as well. The below USO column has now been restored with the correct values. Maybe the title should be changed to United Kingdom for those that want to be exact! It's not about being exact it about being correct, Northern Ireland is not part of Great Britain but is part of the United Kingdom but most people interchange the words 'Great Britain' and 'United Kingdom' as if they were. They also think the British isles is the same as Great Britain which it is not. Added NI to title to make people happy. Was not in the original simply because the classifications in Northern Ireland are not a pure rural/urban split. My own constituency figures are buried in the Deep Rural set of data, and don't come anywhere near. The problem here is that Rural Scotland is a whole set of data on its own, and it doesn't look good. In my case, the figures have been static, or even worsening, over the last 6months, as little if any progress has been made to address the imbalance of improved BB rollout. We have less than 71% Superfast (24Mbps), and that has not improved since September 2018. It would be worth re-analysing the data across the UK for the low-20% median figures in rural areas to give real significance. A correction to the above post - the situation is less than 71% on EU(30Mbps), and less than 73% on UK(24Mbps). It's still the same picture - static.